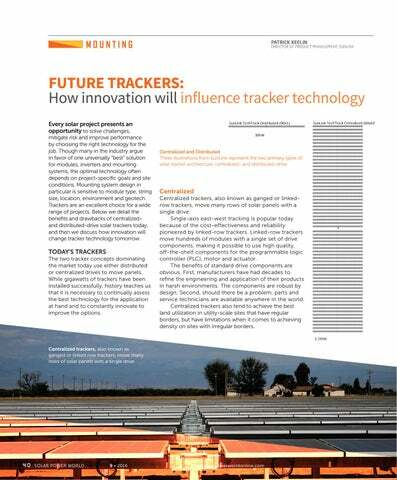 FUTURE TRACKERS: How innovation will influence tracker technology Every solar project presents an opportunity to solve challenges, mitigate risk and improve performance by choosing the right technology for the job. Though many in the industry argue in favor of one universally “best” solution for modules, inverters and mounting systems, the optimal technology often depends on project-specific goals and site conditions. Mounting system design in particular is sensitive to module type, string size, location, environment and geotech. Trackers are an excellent choice for a wide range of projects. Below we detail the benefits and drawbacks of centralizedand distributed-drive solar trackers today, and then we discuss how innovation will change tracker technology tomorrow. TODAY’S TRACKERS The two tracker concepts dominating the market today use either distributed or centralized drives to move panels. 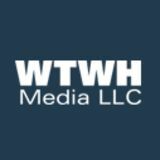 While gigawatts of trackers have been installed successfully, history teaches us that it is necessary to continually assess the best technology for the application at hand and to constantly innovate to improve the options. Centralized and Distributed These illustrations from SunLink represent the two primary types of solar tracker architecture: centralized- and distributed-drive. Centralized Centralized trackers, also known as ganged or linkedrow trackers, move many rows of solar panels with a single drive. Single-axis east-west tracking is popular today because of the cost-effectiveness and reliability pioneered by linked-row trackers. Linked-row trackers move hundreds of modules with a single set of drive components, making it possible to use high quality, off-the-shelf components for the programmable logic controller (PLC), motor and actuator. The benefits of standard drive components are obvious. First, manufacturers have had decades to refine the engineering and application of their products in harsh environments. The components are robust by design. Second, should there be a problem, parts and service technicians are available anywhere in the world. Centralized trackers also tend to achieve the best land utilization in utility-scale sites that have regular borders, but have limitations when it comes to achieving density on sites with irregular borders. Centralized trackers, also known as ganged or linked row trackers, move many rows of solar panels with a single drive.